Ugh.... How many are you getting? Because they take a while, I've only seen it maybe twice . . thereabouts. Can't say if they're all coming out that way as a consequence. I figured it might be a problem of one armor piece overriding everything else but no inventory is new to me. I feel it's Armor Keywords myself, but thought to ask in the event someone sees something similar so we can squash it. Have you seen any rockets or flamers? How about Power Armor? Afraid not. Also no Forged or rather Forged-armor wearing recruits. Dreadnaughts for sure though. So I found the forged weapons are populating just fine.The Forged look is an outfit, not a set of armors so it wont be able to pull that into the gangs without some scripting. I try to do everything without scripts because KG is a script fanatic and adding more scripts tends to cause issues. I will be updating my Cages Mod to spawn my new Forged NPCs with the correct faction for Conqueror as well as their outfits. As far as the naked NPCs I think I have too many references for Raider types so I will reduce those. This should actually give more variety since I will be removing similar types of NPCs which are somewhat irrelevant. Updates for both of these should happen this evening. Had the funniest interaction last night. I saw a "Forged" at my Outpost who I thought was wearing one of my PA's (I thought it was mine, maybe I had left a fusion core in it). They decided to exit the PA for some reason, so I decided to take it back. It did say Steal on it, which is typical of me because I knock enemies out of their armor and loot their s*** anyway so they all say Steal when I enter them (makes me feel all raidery). As soon as I put in a core my raiders turned violent. Hypocrites! That was funny as hell. I REALLY want to use this, but I do not want to install AWKCR. I know i'm dreaming here but if raider overhaul would update to 2019 standards that would be cool. Hey does it work with the restored content version as well? It will but some of the NPCs will not be available for your squads. Thats OK though, it will make the "normal Raiders" distinguishable from the Raiders in your gang. There is an update for the Raider Overhaul Patch. I accidentally moved 2 Dog NPC to the level list. Ah kay kay I see now haha, neat, is it safe to get rid of the human doggies? they didn't went away after the update xD im thinking some manual problem solving with bullets to the brain? Thats how I solve most problem in life. Got rid of em but I seem to keep getting human dogs afer the update, new recruits that is, are they baked in now or smth? the moment I saw Conqueror, I prayed somebody would do this. You are a gentleman and a scholar, sir. Have some kudos. Thanks! 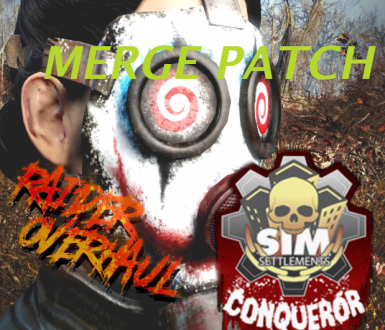 I didn't think Conqueror could get much better but you did it! I've got raider Overhaul and I've got uniqueNPC which has an option for replacing the original RaiderOverhaul.esp. From what I assume about uniqueNPC, this shouldn't make a difference and probably will work just fine with this patch, but that's my assumption. Does anyone know? Should I go back and reinstall uniqueNPC and raider Overhaul but this time leave the Unique npc replacement esp out of it? I actually don't know if that was an option in retrospect. Also I have raiderOverhaul placed under unique npc in load order. Should this go under both? do we need raider overhaul installed? Yes - specific requirements are on the description page. I was hoping Raider Overhaul would be patched into Conqueror. Thanks MrJoseCuervo!